Like any other festive occasion, the Dragon Boat Festival has also got its unique customs and traditions. Every year, these are performed by millions of the Chinese population. TheHolidaySpot attempts to introduce you to some of the most popular customs related to the Dragon Boat Festival. Go through these and familiarize yourself with this grand Chinese festival. If you want to have your friends know about these fascinating Dragon Boat Festive traditions, click here to refer this article to them. Have a great Double Fifth Day! 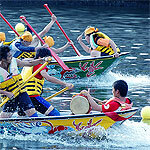 The Dragon Boat Race is perhaps the most important part of "Duan Wu Jie". Every year, hundreds of boats are brightly painted and decorated beautifully to make them ready for the annual regatta that is held during the time of Double Fifth celebrations. Generally these range anywhere from 40 to 100 feet in length, with wooden heads shaped like open-mouthed dragons fitted at the front, and a scaly tail attached to the stern. Depending on the length, up to 80 rowers can power these boats. A drummer and flag-catcher stand at the front of the boat. Prior to the entry of a dragon boat in the competition, it must be "brought to life" by painting the eyes in a sacred ceremony. Races can have any number of boats competing. Competing teams row their boats forward to a drumbeat racing to reach the finish end first, with the the first team to grab a flag at the end of the course being declared the winner. Dragon Boat races are the most exciting part of the "Duan Wu Jie", and draw a huge number of spectators each year. Annual races take place all over China, Hong Kong, Macao, Taiwan, and other overseas Chinese communities. Dragon boat Racing is now an international sport and is now held in many major nations of the world. The Dragon Boat Festival is supposed to commemorate the suicide of Qu Yuan, the great patriot and China's first poet, on the fifth day of the fifth lunar month in 277 BC. It is believed that immediately after Qu Yuan's offering of himself to the Miluo river, the local Chinese people threw into the water dumpling made of glutinous rice wrapped in bamboo or reed leaves so that the fish would not touch the bosy of their beloved poet and rather spend their energy in eating the rice. The modern custom of eating Zong Zi (bamboo leaf wrapped steamed rice dumplings) and throwing them into the water is believed to have developed from this ancient activity. Zongzi is now the the traditional food for the Dragon Boat Festival. These glutinous rice balls come in different shapes - generally triangular or pyramidal, and with a variety of fillings - such as egg, beans, dates, fruits, sweet potato, walnuts, mushrooms, meat, or a combination of them. The fillings are generally steamed. Dates form the most popular fillings. The drinking of Chinese liquor seasoned with realgar (a rare soft orange mineral consisting of arsenic sulphide) is a very popular practice during the Dragon Boat Festival. The ancient tradition of drinking Xiong Huang Wine has turned into this modern custom. This is for protection from evil and disease for the rest of the year. During Double Fifth time, adults and children in China carry with them fragrant silk pouches filled with spices. Hand-made by local craftsmen, these small spice bags of silk, fine satin or cotton are commonly believed to perform the dual function of scaring evil spirits away and also as a lucky charm in bringing happiness and prosperity to its wearers. These are still used today in the country. Skilled craftsmen often embellish these bags by embroidering onto them figures of different shapes, like that of animals, flowers and fruits. Chinese herbal medicines are also sometimes added to the spices inside the bags for added effect. The image of Zhong Kui can commonly be found upon Chinese doors, especially in the time of Dragon Boat Festival. In the days leading to "Duan Wu Jie", a picture of the fierce-looking Zhong Kui(or Chung Kuei) brandishing a magic sword is hanged on the door of many Chinese homes. Zhong Kui is a figure of Chinese mythology and traditionally regarded as a vanquisher of ghosts and evil beings. The custom is believed to grant one protection from evil for the rest of the year.